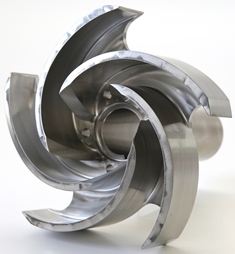 Let’s take another look at opportunities to improve pump impeller fabrication methods. Our previous exploration of this topic centered on an expensive alloy, AL6XN. Because of the material price, material reduction on a small quantity lot offered tremendous savings. It would logically follow that reducing your consumption of other expensive alloys like Nitronic-50, Inconel, Hastelloy, Monel, Alloy-20, and numerous others would provide a similar benefit. What if the material isn’t so pricey? Guess what; we have an answer for that. We find that commonly used alloys run in larger order sizes, so the material reduction advantage is still in play. It may cost less per pound, but so much is removed during large lot runs that the savings percentage is even greater than the exotics in many cases. This also takes into account the elimination of cutting the time that adds up to significant hours of operation in larger lot sizes. 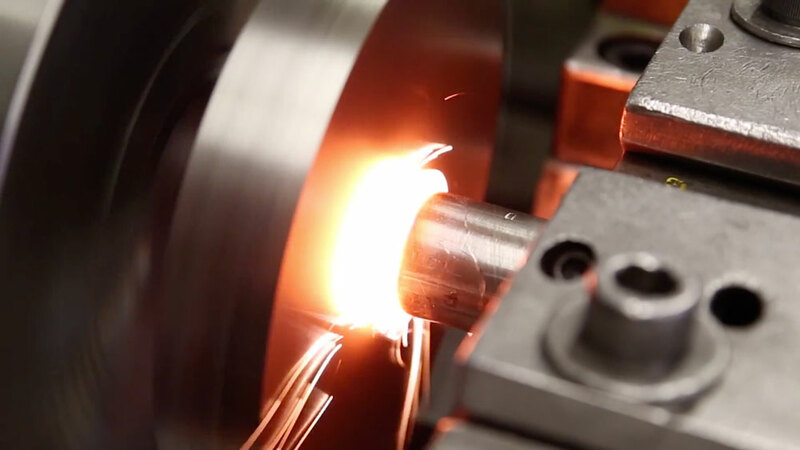 See another video showing a time-lapse comparison of friction welding next to cutting down on a CNC lathe. 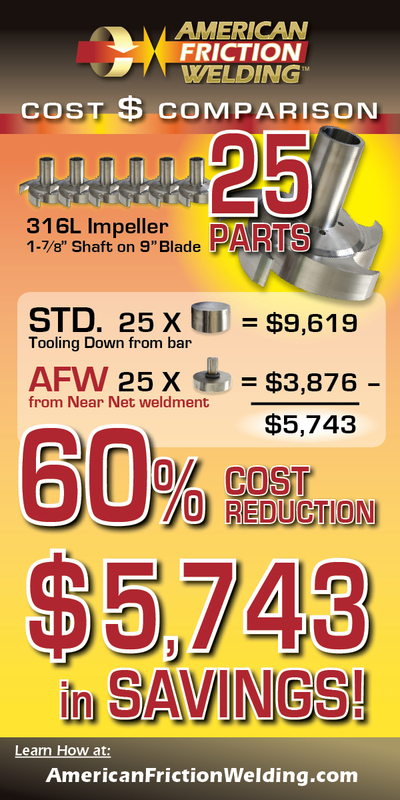 The difference is a saving of $229.72 per piece or 60% of the single piece version. 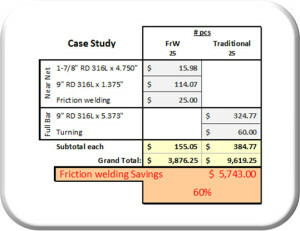 On the 25 piece order in this case that adds up to $5,743.00 per lot by simply reducing the amount of material used. This common grade of stainless sees far more frequent use than exotic alloys, so the opportunity for higher volume lots translates into incredible percentage savings. Reach out and let us know what you are thinking. Our team is ready to evaluate your project and advise on the feasibility of moving forward with friction welding. It is a big step and one that many find well worth taking.